Almondsbury Interchange Hotel, has an excellent location for business and leisure guests, on the outskirts of Bristol and close access to the M4 and M5 motorways. Our friendly and comfortable 50 bedroom hotel offers great value for money, with the best rates in the area. The Almondsbury Interchange is the value for money hotel in the area, on the northern outskirts of Bristol in the village setting of Almondsbury. For business, Ideally located for Aztec West Business Park, excellent links to the M5 and M4 Motorways, and MoD Abbey Wood. For leisure guests, we are centrally located for the many attractions Bristol has to offer, as well as Weston-super-Mare, Jump Bristol, and Blaise Castle House Museum. Our economy hotel offers comfortable accommodation, a relaxing lounge bar serving delicious food in the evenings, and flexible meeting and event space. With complimentary car parking and free Wifi in the hotel public areas, we pride on being value for money for the cost conscious traveler. Our budget hotel features 50 bedrooms, with a choice of single, double or twin beds. We also have extra-large family rooms, ideal for 2 adults and 2 children. All rooms are en-suite, with tea coffee making facilities and large flat screen TV’s. 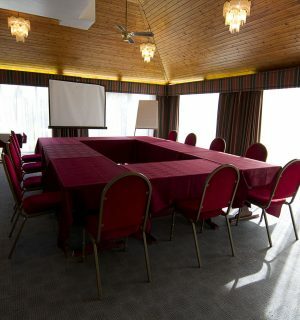 Situated just off Junction 16 of the M5, the hotel is the ideal location for business gatherings or special events. Our flexible packages range from £20.00 per person, for a full day meeting including lunch and tea and coffee, or from £10.00 for an evening party buffet.